While it is true that blackjack is a skill-based game, having a reliable strategy is not the only thing that you need in order to win. There are other factors such as money management and luck which also contribute to creating the big picture. Even if you are a proficient blackjack player and you use an efficient system, at some point during the game you will most likely find yourself in a situation in which your chances of winning are extremely low. In blackjack just like in life, certain events are beyond our control and no amount of knowledge can alter this reality. Luckily, in such unfortunate situations you have the opportunity to take advantage of the surrender option. In order to manage to cope with these situations successfully, it is really essential to think them through and prepare as much as possible beforehand. Thus, let’s have a look at why, how and when it is best to make this move. The surrender option in blackjack gives you the chance to forfeit half of your original bet and keep the rest, if you are sure that your hand is bound to lose. In general, you can perform this move straight after you’ve received your first two cards, providing that you haven’t made any other moves such as hitting or standing. In order to be able to surrender, the up card of the dealer has to be either a 10-valued card or an ace. In contrast to the rest of the moves in the game, when it comes to the surrender option, there isn’t a universal hand gesture you can use. In order to indicate it, you should simply turn to the dealer and announce your intentions clearly. After that, your cards are removed and the dealer collects half of your original bet. You get to keep the rest of your wager but you are deprived of the opportunity to play your hand. Even though at first glance it may seem odd to sacrifice half of your bet and your hand without playing it, this move can be actually very beneficial in some cases. In situations in which you don’t stand a realistic chance of winning, it is wise to try and get back some of your money instead of losing them all. In general, there are two types of surrender which you can take advantage of. 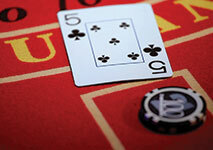 The first surrender option which is offered in some blackjack games is called early surrender. In such cases, you have the chance to withdraw from the current round before the dealer has checked for blackjack. Unfortunately, nowadays not many casinos offer this move as it can be very advantageous for players if used correctly. Thanks to it, you have the opportunity to get some money back in situations in which you were bound to lose everything. For instance, if the up card of the dealer is an ace and you have a hard total of twelve, thirteen, fourteen, fifteen, sixteen or seventeen, then it is best to make this move. If the dealer’s up card is a ten and you happen to have a hard total of fourteen, fifteen or sixteen, it is also recommended to take advantage of it. The main difference between early and late surrender is that you can make the latter move after the dealer has checked for blackjack. From both options you can choose, this one is more widespread and it can be found in many variations of the game. Presently, this move is available in a number of traditional land-based casinos as well as in many online gaming houses. It is recommended to take advantage of the late surrender option when the up card of the dealer is an ace and your hand totals fifteen, providing that the dealer is enforced by the rules to hit on soft 17. As already mentioned, at some point during the game you might find yourself in a very unfavorable situation in which you are doomed to lose your hand. If you are certain that you stand no chance of winning, then you can give up your current hand and in return, keep half of your original bet. This move can be very beneficial, however only if you use it when it is really needed. Some players tend to apply a rather conservative approach and surrender when their odds are slightly unfavorable. As a result, they end up losing more in the long term as they voluntarily forfeit half of their bet for no reason. Let’s assume that you have a total of sixteen in your hand and the up card of the dealer is a 10-valued one such as a queen. In such cases, your best option is to surrender as your chances of going bust are very high. Another situation in which you should consider making this move is when you have a total of four, five, six or seven in your hand, providing that the up card of the dealer is a face card, a ten or an ace. It is observable that in such cases, the dealer’s position is rather strong, whereas yours is exactly the opposite. It will be very hard to improve your hand with just one hit and beat the dealer’s total. Therefore, your best choice is to surrender and at least keep half of your original bet. You should bear in mind that if you have realistic chances of getting a card which can help you win then it might be best to simply risk and have fun. It is worth mentioning that the rules regarding the surrender option can vary, depending on the blackjack version and the casino. Thus, it is always a good idea to double check whether this move is available before joining a particular game. If you have decided to use a basic strategy which features the surrender option and you sit on a table which doesn’t offer this move, you won’t be able to implement your plan correctly. In general, if the surrender option is permitted, the house edge decreases by approximately 0.80%. Even though at first glance it may seem like a very small reduction, you should bear in mind that the total percentage of the house edge is formed by adding up every single rule. If you have the chance to make the game a bit more favorable for you, you should always try to do so. In some blackjack variations, one of the moves which you can make during the game is to surrender. In general, you are advised to take advantage of this option when you are certain that your hand doesn’t stand a chance of beating the dealer’s total. By choosing to surrender, you give up your current hand along with half of your initial bet, however in return you get to keep the rest of your wager. This move can be very beneficial for you if you get familiar with all of the cases in which it is best to be made.